You are about to take a bus ride into another dimension. No, not a trip to the Twilight Zone. Or, maybe it IS to the Real Twilight Zone! Despite the nonsense that comes from Oprah’s media pulpit, all roads are not radii that lead to God and Heaven. Instead there will be a Fork in the road. It is this bus ride that will take you to that juncture, albeit through fantasy. I learned about this bus ride from a recent series of classes I attended at a nearby church. The topic of the class was C.S. Lewis’ book The Great Divorce. The discussion was led by a retired Wheaton College professor, Dr. Rolland Hein, Professor Emeritus, English. Dr. Rolland also teaches a class on Saturday mornings at the Wade Center which is located near the college. The Preface to The Great Divorce lets us know that Lewis will be endeavoring with his dream story to break up the marriage of Heaven and Hell (a response of sorts to William Blakes’ book The Marriage of Heaven and Hell), a marriage that many in our lifetime wish for. He writes to inform us of their necessary divorce. In an age of moral relativity and subjectivism many want to synthesize good with evil in hopes of redeeming evil. But as Lewis reveals, the choices we make take us down divergent pathways. We either choose a path of good that becomes an even greater good as we continue to make good choices and stay on its narrow way or we choose a broad path that leads towards ever greater evil. The Great Divorce offers us a bus ride from “grey town” with its “continued hope of morning” to the “High Country,” a place of contrasts and a place where God honors the choices we make. You will meet many characters, many perhaps like someone you know. There will be those who cannot fathom Heaven as any place they would want to stay and there are others who fear losing what they had on earth in “grey town”. There will be the proud, the stubborn, the willful and the angry. There will be those who demand their rights and also the ego-unchallenged. There will be those whose feet hurt them as they walk on solid ground for the first time and there will also be the “bright solid people” who move about the “High Country” without effort. And finally, there will be those who reject Joy and solid Reality to return to “grey town” on the same bus. 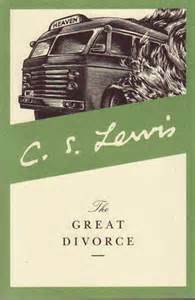 Lewis’ The Great Divorce is the imaginary bus ride to the Fork in the road. Great post! Just wanted to comment that George MacDonald was not Lewis’ friend as he died in 1905 and Lewis was born in 1898. They never met but MacDonald was still his mentor through his works. Hi. Yes you are correct. Thanks for pointing this out. I knew that Lewis looked up to MacDonald but they had never met in person, only through MacDonald’s writings. I will say, instead, that MacDonald and Lewis were kindred spirits in that they both loved fantasy. J.R.R. Tolkien was Lewis’ literary (& literal) pub friend. Oohhh I haven’t read Alister McGrath’s book. I will have to have a read. Thanks!